Or, perhaps you would like to leisurely explore the area’s natural beauty by visiting the Wisconsin Trapshooting Association’s Shooting Complex and Learning Center located at 1312 Akron Drive… This facility sits on 280 acres of forest land in the Town of Rome. There are 30 trap fields that offer a wide variety of trapshooting experiences. There is American style trapshooting as well as an Olympic bunker for international-style trapshooting. Practice shooting is open to anyone who would like to participate. Hours are 11am-5pm and there is a fee. Dyracuse Recreational Area will also be open and offering FREE tours from 3-6pm on Thursday, 6/25. This 334-acre motorcycle and ATV (all-terrain vehicle) park located at 1047 County Rd O, is open from early April until the last weekend in October. There is a peewee track, a motocross track, supercross track, and over ten miles of trails. There are also picnic grounds, grills, tables, a shelter house, children’s playground, restrooms, and hot and cold water provided. The park is funded by the State of Wisconsin and operated jointly by the Town of Rome and the Rapid Angels Motorcycle Club. To experience more of the area’s natural beauty, the highly anticipated Sand Valley Golf resort is offering guided nature walks on Sunday, 6/28, including flora and fauna (plants and wildlife distinct to the area) handouts. The 45-minute tours leaving at 10am, 11am, 12noon, and 1pm. The first course on this 1500-acre sand barren (a prairie-like habitat that once formed the bed of a massive prehistoric lake in Central Wisconsin) is currently under construction and is scheduled to open in 2017. Work has also begun on the second course which is scheduled to open in 2018. Developer Mike Keiser hired golf course architect David McLay Kidd to design the second course. Kidd is best known for his designs at the Castle Course at St. Andrews and the highly acclaimed Bandon Dunes in Oregon, ranked 8th on Golfweek magazine’s 2014 list of Best Modern Golf Courses. Even though Sand Valley is not yet ready for play, Lake Arrowhead is offering an “All Weekend Golf Special” including 18 holes, cart, and practice balls for only $55 when you mention the code “ROME.” Lake Arrowhead was selected as Course of the Year for 2013 by the Golf Course Owners of Wisconsin… Staff members of the Wisconsin State Golf Association and the Wisconsin PGA joined together in selecting Lake Arrowhead’s Pines and Lakes courses for their exceptional quality and competitive play, outstanding management staff members and customer service team, recognized community involvement and significant efforts to grow the game of golf in Wisconsin. In addition to many activities available throughout this 4-day event, the main celebration will be Saturday, June 27th, starting at 6pm at the Lure Bar & Grill. They will be featuring music by “Copper Box” and a spectacular fireworks show with new and exciting nautical fireworks. “When in Rome… do as the Roman’s do…” and have a wonderful time! There’s something for everyone in Rome! On June 26-27 Cabela’s Masters Walleye Circuit will be hosting a walleye tournament on Lake Petenwell. More details and a fact sheet can be found at http://masterswalleyecircuit.com/tournaments/schedule/. A little information about Cabela’s Masters Walleye Circuit taken from their website. 31 YEARS AND GOING STRONG! If you’re looking for world-class walleye fishing and the chance to win thousands of dollars in cash and prizes, plus great competition—all in a professionally-run tournament atmosphere—look no further than the Cabela’s Masters Walleye Circuit. Since 1984, the Cabela’s MWC has set the standard for team walleye tournament fishing. Each season, we visit the finest walleye fisheries at peak fishing times to give our MWC teams the best possible experience during pre-fishing and competition. Plus, MWC events are more than two- or three-day tournaments. Many teams arrive early for pre-fishing and experience a week or more of great walleye action while fine-tuning their patterns and exploring the wonderful host communities. And because camaraderie is an MWC hallmark, you’ll also enjoy getting to know other MWC teams. This is not just a Circuit, it’s a family. Even though the competition is intense and the stakes are high, our teams share a common bond in their passion for walleye fishing, and many of our anglers form friendships that last a lifetime. Another great benefit is the MWC’s proven team format—which lets you share all the fun (and expenses) with your favorite fishing partner as you compete for nearly a $1 million in cash and prizes and well over 100% payback in cash and prizes each season, with great contingency cash and prizes from our valued sponsors and a no-entry-fee, World Walleye Championship for the season’s top finishers, the MWC offers excellent odds of cashing some serious checks. Fisheries conservation and teaching kids to fish are cornerstones of the Cabela’s Masters Walleye Circuit foundation. And each season, our MWC Conservation Fund and Youth and Family Fishing Clinics help make the walleye world a better place. Since 1984, the MWC Conservation Fund has generated more than $350,000 for fisheries conservation projects in states where our tournaments are held. Monies are derived from a $15-per-boat contribution from the MWC and the anglers, and distributed to state fisheries agencies, walleye clubs, and other community organizations. To encourage the next generation of anglers, the Cabela’s MWC holds a Youth and Family Fishing Clinic at each tournament. MWC anglers and representatives of the NPAA volunteer their time to teach kids and their parents about fishing. The MWC and our sponsors also donate products—including rods, reels and tackle—to help get these budding anglers’ fishing careers off to a great start. By fishing the Cabela’s MWC, you’ll help both of these wonderful programs make a difference in the future of walleye fishing! Are you still in the market for lake property? If so, check out this FREE, ONE DAY LAKE HOUSE SALES EVENT and let me know if you can make it. On October 19th, 11 lake houses that are currently for sale will be open for tours. Over $4,000,000 of Log homes, lake cabins, and traditional waterfront houses ranging from $230,000 to $640,000 will be part of the tour. If you would like to stay the night we have a great deal for you. Ask about our stay and play package where you can stay overnight at a lakeside resort including dinner for two at a waterfront restaurant for less than $100 (limited availability, call or email for details). If you prefer a vacant lot we’ll be ready to assist with maps, price sheets, and a variety of lake access lots starting at $19,900 and lakefront lots from $79,900. You will not want to miss this one day Extravaganza. Welcome to the first installment of Terra Firma’s Featured Lake Properties of the Month. Each listing represents a strong value based upon the cumulative attributes of the property as it compares to the most closely related properties. PL #57 – Lake access, deeded pier slip for your boat and your very own sunset. Also includes a completely wooded lot to build your dream lake home on! Motivated Seller, let’s make a deal. A STEAL AT $24,900. Nicely wooded lot with permanent boat slip on Lake Petenwell. Camp or build your cabin in the woods and walk right across the street for a boat ride. Never have to worry about pulling your boat out every evening. Access to 2 miles of hiking / cross country ski trails right from your lot. Close to 2 championship golf courses, multiple restaurants, and small town shops. Thousands of acres of public forest near by and ATV and snowmobile trails too. The perfect spot for recreation or relaxation. Don’t delay. Request a data sheet, maps, and more pictures HERE. LVPT # 52 – Amazing 2 acre lot with unbelieveable views and a sandy shoreline!! Enjoy this nicely wooded, level lot that is only a few steps from your 2003 Bennington 20ft pontoon boat which is included in the sale of this property. Buy this lot and get a free pontoon boat. Nicely wooded,level,2+ acre lot has 154ft of front. on WI 2nd largest lake. Long range eastern views, easy access to the lake via your already installed dock, you will be able to enjoy this full recreational lake right away. Buildable, no time requirement to build, choose your own builder. Incl. like new 2003 Bennington 20ft pontoon boat and accessories. Priced at $139,900. N14529 Point Ct. – Beautifully built 1-1/2 story home with vaulted ceilings and outstanding views. Sit on your wrap around deck and watch the kids jump off your pier or tube out in front. Finish off the walk out lower level, add a 4th bedroom and rec room. Already plumbed for a 4th bath too. Beautiful, like new, cedar sided home with open floor concept and amazing southern views across 6 miles of water on Lake Petenwell. Well built for entertaining family and friends. Huge great room with wood burning fireplace, dining area, and kitchen with work island and breakfast bar. Large rec room, main floor master suite, huge deck overlooking the lake and a walkout basement. Loft, 2 bedrooms and a full bath upstairs. Nicely wooded, 2.21 acre lot close to beach and boat launch. EZ lake access, dock included. Priced at $425,000. 521 Barnum Bay Trail – WOW, look at the views and the stunning beach!! 3 bedroom, 3 bath ranch living with a lower level to finish as you like. Level lot, amazing sand beach frontage, and sunset views to die for. Arguably the best location on the lake. JUST $255,000. LOOK AT THE BEACH!!! This 3 bedroom, 3 bathroom lakefront home has almost 1,800 sq. ft. of living space with sand beach on Lake Petenwell. Enjoy long range lake views with gorgeous sunsets on the 2nd largest lake in WI. This home features the ease of ranch home living with a full basement you can finish for extra space. Brand new stainless steel appliance package included. At 23,000 acres Lake Petenwell offers all the fun and great fishing you could ask for. Close to golf, shops, boat launches and dining. SVS # 35 – Check out this Lakefront DEAL. Everything you want, level lot, no stairs to the dock, huge 5 mile long lake views, southern exposure, sandy lake bottom, driveway and building site already cleared, wooded, 2 acres, 150′ of lake frontage. Are you looking for the perfect lakefront lot with level frontage, no stairs to worry about, beautiful long range lake views, mature trees, quiet street, and on a large recreational lake? Look no further than this gorgeous Lake Petenwell waterfront lot. Located on a quiet cul-de-sac, this 2 acre+ lot has over 150′ of level frontage with southern exposure and 4+ mile long lake views. One of the best spots on the lake with sandy lake bottom, deep water access, and almost always calm as glass. PERFECTION!! Priced at $124,900. Take in a few of these fun activities in the Lake Petenwell area this coming weekend. Jazz N Pizazz Summer Music Seriers. 6pm – 9pm. 1472 Apache Ave.
“The Hatfields and McCoys 2013. South Lake Center, 1374 Raindance Tr. Hole tournament, register in advance. Adams Flea Market, 8am – 4pm. 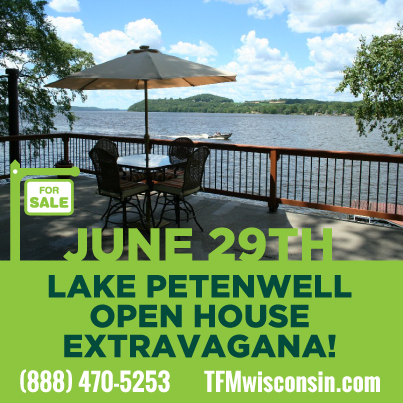 If you are currently in the market for lake property you won’t want to miss this Lake Petenwell Open House Extravaganza. 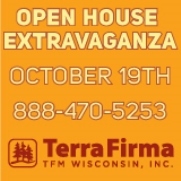 On June 29th we will have at least 10 lake homes part of an Open House Extravaganza where you can tour several homes ranging in price from $230,000 – $640,000 located around Lake Petenwell just 40 minutes north of the Wisconsin Dells. These log homes, lake cabins, and luxury houses will give you a great variety of ideas and possibly you will even find the perfect match. If you are not looking for a home but prefer a lake lot, you can stop by and see us at one of the homes and we will point you in the direction of lots that meet your specific search. We will have maps and price lists with us so you can look at some lots at your leisure. Stay for the whole weekend as we have a discounted lodging and dinner package for just $80 total. Lodging at Bay Rest Resort on the shores of Lake Petenwell and dinner at the waterfront bar and grill known as Lure. If you bring your boat we’ll even provide you with a boat slip for the weekend at Barnum Bay Marina so you don’t have to put it in and out of the water each day. More details of the event, list of homes on the tour, and links to each home’s info and photo gallery are located HERE. Be sure to register for the event at this THIS link and let us know if you would like to take advantage of the lodging and dinner package as our rooms are limited. All registered parties that attend will be entered into a drawing for a free lodging and dining package. We hope to see you at the lake on June 29th. A lot is happening during the month of May in the Lake Petenwell area. Enjoy all that the area has to offer as we move into spring. Live Music 6:30 – 10:30pm Lake Arrowhead, Pines Lounge 1195 Apache Ln., town of Rome. Public is welcome. Kickoff Party – Pizzazz N’ Jazz 6pm, Lake Course Pavilion, 1472 Apache Ave. town of Rome. Public Welcome. If you have ever toured the shoreline of Lake Petenwell you might think that Log Home Living had something to do with the development. More often than not you will find gorgeous custom log homes ranging in size from 1,000 – 20,000 sq. ft. in size. Now these are not your old log homes heated just by wood stoves, with no running water, and missing the modern conveniences we have all come accustomed to enjoy. Many of these log homes not only have all the modern conveniences but also many of the high end luxuries you would expect in top of the line homes. Granite counter tops, solid wood floors, chef’s kitchens, soaring vaulted ceilings, air conditioning, back up generators, geo-thermal heat, custom outdoor kitchens and fire pits, and typically loads of lakeside windows to take in spectacular views. Below is a sampling of log homes currently for sale on Lake Petenwell. A select group of lots will be liquidated this weekend on Lake Petenwell for well below market values. 2-acre lake access lots with a permanent boat slip will be sold for only $29,900. 2-acre lakefront lots with 150′ of frontage and awesome sunset views will be sold for just $99,900. And, if you are in the market for a much larger parcel, how about 6 acres with 450′ of frontage for just $249,900. These values represent a 60% – 70% discount to their original prices and are one of those pockets of opportunity that are hard to pass up. Can you make it up for the event this weekend? Give us a ring at (888)470-5253. Is NOW the time to buy lake property? Carolyn Bigda and Amanda Gengler wrote in the July issue of Money Magazine that “now is a compelling time to acquire a second address”. Need financing? Thirty year fixed-rate mortgages are now only 4% and the Wall Street Journal just published an interesting article. “Low interest rates are driving high-end home buyers to supersized mortgages at a pace unseen since the housing boom. But the deals may have a limited shelf life. So-called jumbo loans, generally those bigger than $417,000, are a better bargain now than they have been in years.” Read the full article here. New research of the south central Wisconsin waterfront market bears some very interesting facts. 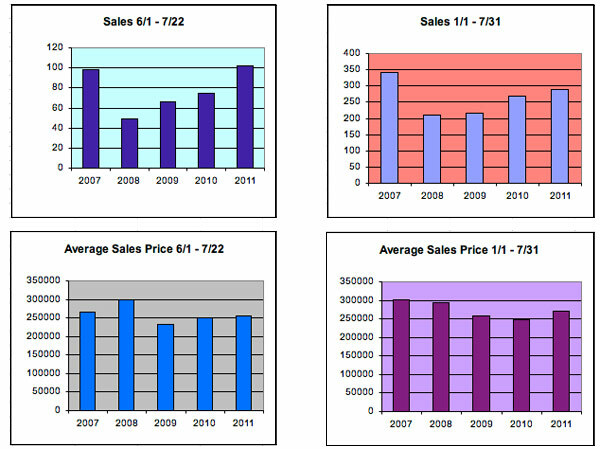 When analyzing year to date sales from 2007 to 2011 its apparent that the volume of sales was lowest in 2008 while the lowest average price was in 2010. The number of sales has steadily increased with 36% more sales occurring YTD in 2011 vs. 2008 while average prices are now at a 3 year high. Summer sales, which occurred from June 1st to July 22nd of each calendar year, are even more interesting. In that 7 week period there were 102 waterfront sales this year compared with 98 in 2007. 2011 showed an increase of 208% when compared to sales in 2008 and it’s NOT due to discounted prices. The average YTD sales price is at a 3 year high and is within 4% of the average sales price in 2007. We occasionally hear that buyers are waiting for the market to bottom. These metrics clearly show that the overall market for waterfront property has bottomed and that recovery is well on its way. There are still some great opportunities available and that’s where we come into play. If you are in the market for lakefront, and you’re positioned to make a purchase this year, we can identify those great bargains for you. We specialize in everything waterfront and if we don’t have what you are looking for, we will find it for you. Through our Buyer’s Brokerage Program we can locate, help you negotiate and close on your dream waterfront property. So what are you waiting for? With the upward swing already taking place and interest rates at a historic low, NOW is the time to buy and we’d be honored to assist you with your purchase.